Out on a limb, out in the middle of the 7th St Bridge over the concrete canal that is the Los Angeles River. A long walk there, a long walk back and so many stories along the way. It was dusty work out there Meredith, thank you! And that is LA. Concrete. Great photo! The land of cement ponds! What a huge bridge – those people look so tiny! It’s very ‘concrete jungle’ somehow ………….. Your colour choice is really unusual – but so effective! That bridge seemed to go all the way to Nevada! Thank you Pauline! Excellent. The toning is brilliant. I take that as a huge compliment coming from you Rabirius, thank you so much! Usually I like your street photos very much, because they portrait a vivid fraction of big city life. This one is different – but also really good. There is an ominous feel about it. I love it! Amazing what you get used to, big thank you Paula! I can just imagine the stories. Brave lady. I’m not sure I’d walk out there. Interesting treatment Patti, kind of bleak. Makes me think of the end of the world dream sequence in The Terminator. Thank you Lignum! So many places out there have notices of films etc due to be shot on or around the premises with descriptions of activity – “atmospheric smoke effects, brandishing weapons, foot chase and fight scenes, prop dead body dropped off bridge . . . ” so not to far from Terminator country! Fantastic shot, Patti. At first click-blink, I thought the people were birds. Massive structures! ~T. Thank you so much Theadora! There were ducks on the water so you can imagine how much tinier they were which in turn makes the river space appear even bigger. Fascinating shot Patti with so much to interest me – The Sixth Street Viaduct is quite an unusual piece of engineering. From the width of the channel I assume that the river is very seasonal and becomes a raging torrent at some time each year? I see a train was signalled on the track to the extreme left – did you get to see it? Thought of you Martin! I didn’t see any railway activity to the left but a mighty Union Pacific did make its way up the right. Pictures to come! As for the raging torrent that would certainly be a sight! Wow, thank you for the link Martin – your version is so beautifully crisp and clean, love the detail! Wow! The faded effect you gave the shot makes it look eerie. I’m loving your LA series! Thank you Arianna! Have you been to LA? I think you would love it – go west young girl! Such a tease !! What stories!! You’ve left me hanging!! Lol! Hang in there Derrick, more coming soon (ish)! Oh, Patti, that is an absolute beaut! I so love the colour! Thank you Richard! The colour actually came about through processing the shot in black and white! Hi Patti, lovely shot. 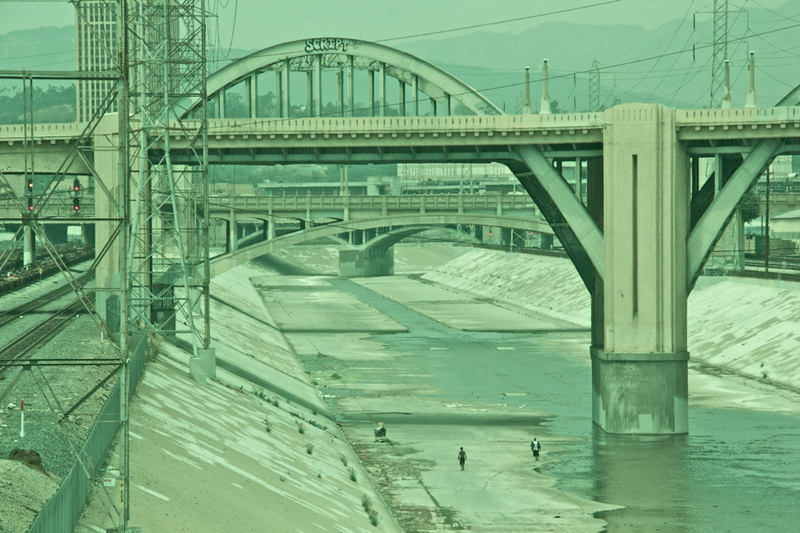 L.A. River shows up in a million movies when they need a water/car chase in L.A.
Doesn’t it just! No action out there this day, just eerie quiet everywhere . . . Thank you Tom. Railroad tracks, buildings, bridges, a concrete river, mountains, and people — all in one shot. I like the tint, too. Something for everyone! Thank you Charles! beautiful again! was it once a real river? Yes Inge, it was once a real river! Thank you! “SCRIPT” tagged way the hell up there! Fantastic shot! Love the colouring and treatment, as well. Gives it a great futuristic vibe. A fantastic composition Patti! And I too love the processing. Look forward to all those stories. Love this Patti – the graffitti adds to the feeling that this is a cartoon or illustration to me – and I love the mystery in here..
Painterly! A strong, beautiful image, but tweaked to perfection! Simply stunning, Patti! It is so rich and layered – love the way the coloring emphasizes the iconic LA heyday Deco bridge, but then when you look again it is so clearly present day… So glad the people are there for scale, you’d never believe the size otherwise. Just a gorgeous photo and composition. It leaves us hungry for more!! A strong image Patti and one thought niggles me……how on earth has the artist left is tag on the apex of the bridge…..must be an acrobat. Great color in this shot. Makes it look like it’s from a dream or something. That is on my must see list.. so many famous scenes!